Virgin Australia has unveiled plans to acquire the remaining 40% stake of Tigerair Australia for a token sum of AUD1, enabling Singapore-based Tiger Airways Holdings to essentially end its unsuccessful pan-Asia Pacific strategy. Tiger, which earlier this year sold its stake in Tigerair Philippines and exited the Indonesian market with the suspension of services at Tigerair Mandala, is now focusing on turning around around its Singapore operation. But the Tigerair Australia brand will be retained and the Tigerair brand is also now present in Taiwan, where the group owns only a 10% stake in recently launched Tigerair Taiwan. The biggest benefit to Virgin could be appeasing its shareholder Singapore Airlines (SIA), which is set to increase its stake in Tiger Holdings from 40% to at least 55%. The agreement could also see Tigerair Australia operate short-haul international routes. Previously Virgin and Tigerair showed no interest in such deployment of Tigerair as Tigerair Australia, which has been consistently unprofitable since launching services in 2007 and has been focusing on improving its performance in the domestic market. Virgin Australia reported on 17-Oct-2014 an 18% reduction in losses for the quarter ending 30-Sep-2014 (1QFY2015) to AUD45 million (USD39 million). This is Virgin's first quarterly announcement, and the abridged statistics do not include revenue or cost figures. But Virgin said revenues increased by 1.3% (faster than the 0.8% increase in passengers; RPKs not disclosed). CASK increased by 1%. This is an unwelcome continuation of Virgin's cost base growing, but is small and Virgin was at pains to stress cost saving measures were not reflected in the quarter. Virgin saw a 0.6% increase in ASKs for 1QFY2015. This was the first quarterly report from Virgin Australia (and indeed, any current Australian airline), issued to align itself with its airline shareholders. This more simplified report included underlying and statutory costs as well as operating statistics, but did not include the half-year and full-year metrics of revenue, costs or yields or any of these figures by segment (domestic/international). 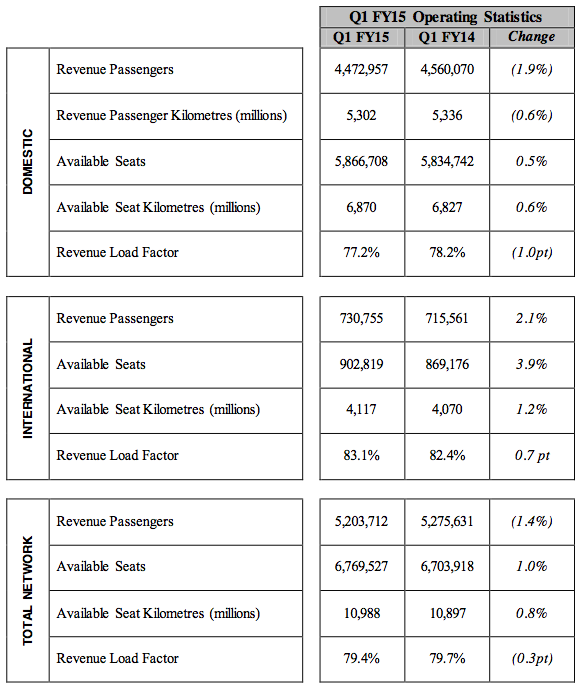 The 1.3% increase in revenue provides only some comfort as revenue growth was faster than the 0.8% increase in total passengers, but this comparison is not the most accurate. Virgin did not disclose system RPK changes for 1QFY2015, although it did disclose domestic RPK changes (down 0.6%). System load factor decreased 0.3ppt. Virgin stressed the first quarter is the weakest, and that there continues to be weakness in consumer demand. Capacity increases in recent years have been exceptionally high. A more serious weakness in the consumer environment would have a severe affect on the capacity growth that has occurred in Australia. The quarter saw an AUD8.2 million (USD7 million) restructuring change and AUD14.3 million (USD12.5 million) hedging ineffectiveness cost. Virgin reports its CASK increased by only 1%. CASK growth has been a closely watched topic as Virgin's "game change programme" has significantly increased its costs at a time Qantas is looking to reduce its costs. 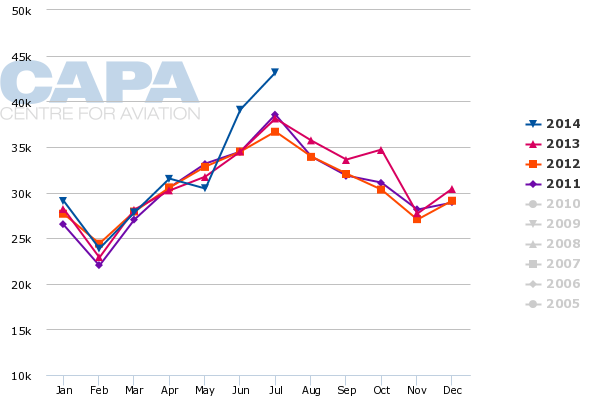 But this is still not enough, as domestic RPKs decreased 0.6%, leading to a 1ppt decrease in load factor. As Virgin Australia added capacity in 2013 and 2014, it erased the domestic load factor improvements it made in previous years. 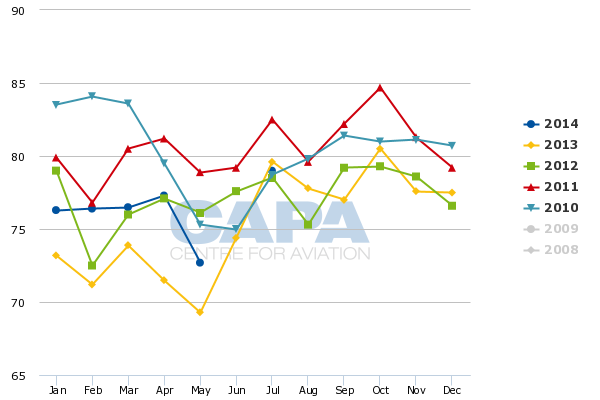 Virgin's most recent monthly statistics, for Jul-2014 (the first month of 1QFY2015) reported a domestic load factor of 79%, down from 83% in Jul-2011. This is a narrowing of the gap when considering Jan-2010, Feb-2010 and Mar-2010 saw domestic load factors of 84%, whereas the same months in 2014 saw load factors around 76%, a drop of 8ppt. Virgin's 0.6% domestic ASK increase is not a universal story. There are still large variances in specific markets as Virgin adjusts capacity, meaning the domestic average comprises markets making improvements, those still improving and those in need of further developments – which may hinge on medium- or long-term changes, like aircraft and product substitutions, that cannot be made immediately. 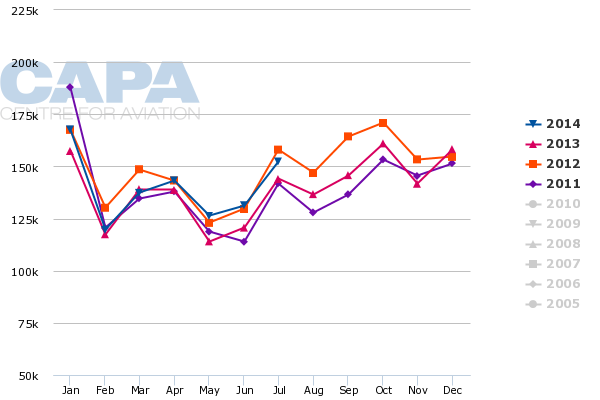 Across all carriers, the Melbourne-Sydney route (Australia's largest, and one of the world's largest) saw a 2.4% decrease in ASKs in Jul-2014, the latest month for which BITRE data is available. This has seen the route fall below Jul-2012 capacity too, but is still 15% above Jul-2010 levels. East-west markets have been a particular challenge as a surge in capacity occurred as the resource boom around Western Australia trickled off and carriers were unable to stimulate leisure traffic given the limited population, long distances equating to high fares and high cost of travel in the region. See related report: Airline overcapacity is concentrated in Western Australia. Can Qantas and Virgin recalibrate? 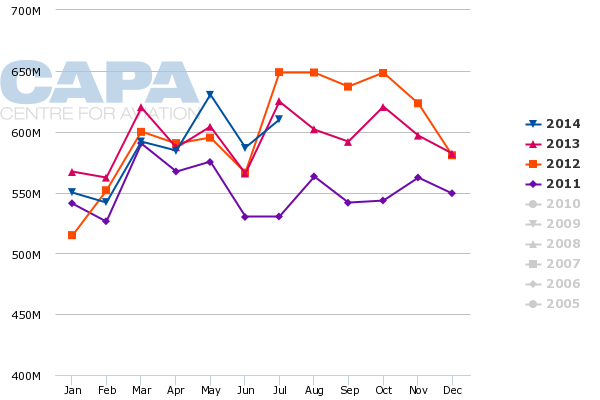 The Melbourne-Perth market in Jul-2014 saw a 7.7% decrease in ASKs from Jul-2013 levels, but is also still well above Jul-2011 levels. Other markets are in growth mode, with Gold Coast-Melbourne up 7.7% in Jul-2014, but down from Jul-2012 levels. 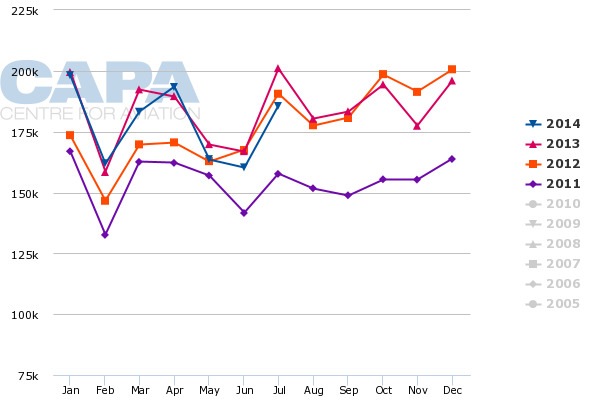 Brisbane-Darwin, after few capacity changes, has soared to record levels with 29.8% growth in Jul-2014. Brisbane-Darwin was Australia's 27th largest domestic route in Jul-2014 and had the fastest growth rate of any of Australia's top 50 markets. The next fastest growing market was Sydney-Hamilton Island (46th largest market) with 19.1% growth. Based on schedules filed with OAG, Virgin plans to have a 0.4% decrease in ASKs in 2QFY2015. Jetstar and Qantas plan for larger 2% to 3% decreases while Tigerair will increase by 20%, albeit from a low base. Virgin's AUD45 million (USD39 million) 1QFY2015 loss excludes Virgin's share of equity accounted losses of Tigerair Australia, which were AUD11.6 million (USD10 million) in 1QFY2015, up from AUD9.7 million (USD8.5 million). Virgin's share of Tigerair's losses was one-fourth Virgin's own loss despite Tigerair having one-tenth the ASKs of Virgin Australia. This under-performing is getting worse, but Virgin has proposed acquiring from Singapore's Tiger Holdings the remaining 40% of Tigerair Australia that Virgin does not own. This would come for a token sum of AUD1 (USD88 cents). Tiger Airways Holdings included in its earnings report for the quarter ending 30-Sep-2014 (1QFY2015) a SGD59.8 million (USD47.8 million) write-off relating to its divestment of Tigerair Australia. Virgin expects to close the transaction by the end of 2014. Tigerair has been looking to clean up its unsuccessful JV strategy, exiting its now closed operation in Indonesia and effectively exiting the Philippines with a sale to Cebu Pacific. Tigerair had retained its Singapore operation, Taiwan start-up (which launched in Sep-2014) and until now its minority interest in Tigerair Australia. Tigerair initially sold a 60% stake in Tigerair Australia to Virgin in mid-2013. Tigerair can no longer afford Australia's losses and expected them to continue. Australia has become strategically insignificant as Tigerair's pan-Asia strategy has fizzled, although the synergies between Asia and Australia were never great to start with. For some time, the only group link between Asia and Australia was Tigerair's (Singapore) service from Singapore to Perth, but this is being cut. Tigerair needs to focus on turning around its Singapore operation, which has been unprofitable due to overcapacity. The interest from Virgin Australia in wholly owning Tigerair is unclear. Virgin already had majority ownership, and purchased its 60% stake with cash injected into it from SIA. SIA was a minority shareholder in Tigerair and is increasing its stake in Tigerair from 40% to at least 55% as part of a rights issue announced on 17-Oct-2014. SIA is one of Virgin's equity stakeholders but arguably one of the more important ones strategically. SIA for its part will still indirectly stomach part of Tigerair Australia's losses (albeit now a smaller share) but the far greater value to SIA is order at Tiger Holdings and nearly bringing to a conclusion the ungraceful chapter that has been its short-haul LCC project. Tiger Holdings will now be concentrated in Singapore (with a smaller operation in Taiwan) as SIA will have greater ownership of Tigerair, leading to further questions if SIA will take the plunge and integrate Tigerair with Scoot once Tigerair does more housekeeping. Virgin Australia CEO John Borghetti in a statement said: “We remain committed to maintaining the airline’s low cost business model and the separate Tigerair brand". Virgin said it had secured "brand licensing and certain services which will continue to be provided by Tiger Holdings direct to Tiger Australia." Tiger Holdings shed a bit more light, saying Virgin would continue to use the central Tigerair website distribution and branding for Tigerair Australia. Licensing terms were not disclosed. Curiously Tiger will licence its branding despite having zero direct control over Tigerair Australia. However, Tiger is likely to appreciate whatever licensing fees (likely small) it can get. There have been ongoing rumours of a re-branding of Tigerair Australia, but the licensing statements, and reference to them being "long-form", indicates the brand may stay. Virgin said it aimed to make Tigerair Australia profitable by the end of 2016, although this will likely be done with reduced aircraft given the increasing losses. Virgin hinted that Tigerair Australia could reduce its current fleet of 13 A320s. Tiger Holdings said it is assuming some commitments from the Tigerair Australia order book of six additional A320s. But Tiger did not say when these deliveries are slated for and how many it has agreed to take over as part of the new deal with Virgin. The six A320s that are currently assigned to Tigerair Australia in the Airbus order book were not included in Tiger Holdings' early 2014 deal with Airbus which cancelled remaining A320ceo orders in exchange for 37 new A320neos for delivery from 2018. Tiger Holdings has been grappling with excess aircraft as a result of its exit in Indonesia and Philippines, where it had 14 aircraft combined (since returned). It recently subleased 12 excess aircraft to IndiGo and is looking to sublease another two to four aircraft. The last matter Tiger Holdings needs at this point is excess aircraft from Australia. Virgin has been impacted by the exceptional growth in the Australian domestic, but is making initial – although arguably still conservative – steps to address this. Left unturned is Virgin's international network, the annual losses of which were disproportionately higher due to short-haul routes. Virgin may be able to address this segment with Tigerair, but even then Tigerair's focus is likely to remain as a domestic story. While Virgin must continue to clean up its own house, Tigerair's losses will drag down any improvement at the Virgin brand.